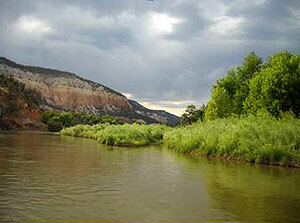 GSA is part of an interdisciplinary scientific team evaluating opportunities for improving flow management of the Rio Chama in northern New Mexico. 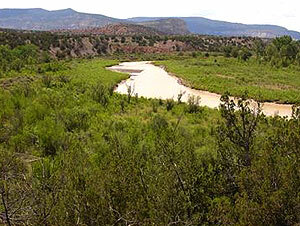 Flows in this federally designated Wild & Scenic River are controlled by El Vado Dam, and the project team is documenting baseline site conditions and current flow demands to determine how dam releases could be modified to improve habitat for downstream aquatic organisms and riparian habitat. 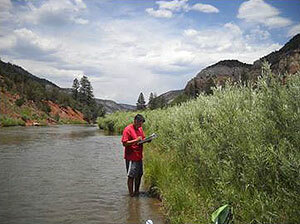 GSA scientists are performing a variety of tasks including: mapping riparian vegetation; evaluating correlations between plant communities and different fluvial geomorphic surfaces; performing tree ring analyses to evaluate relationships between flow management, cottonwood age, and juniper encroachment; co-developing an ecological flow workshop with public and private stakeholders, and; developing ecological flow prescriptions.